Were you to design a city for the purpose of learning and doing high-impact, relevant journalism, you could hardly do better than Vancouver, British Columbia. A Pacific Rim multicultural magnet located a half hour from the U.S. border, Vancouver makes headlines for its cutting-edge urban planning, political and environmental activism, AIDS research, ‘harm reduction’ drug policies and more. And just below the breathtaking veneer lies big city political struggles over money and power, the stakes ranging from multibillion-dollar oil interests to indigenous peoples’ claims to self-determination. 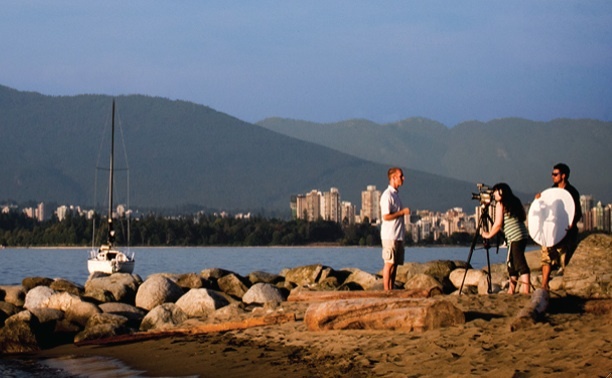 From day one as a student in the UBC Graduate School of Journalism, Vancouver will be your training ground. In your first class, the year-long fundamentals course Integrated Journalism, you’ll choose an area of the city as your “beat,” where you will walk the streets, attend community events and establish trusted sources in order to write stories, many of which will be published on TheThunderbird.ca, the school’s award-winning online news service. Your assignment topics will range from headline news, such as civic elections and the Olympic Games, to ongoing big-picture issues such as environmental conservation, immigration and housing. Other classes will allow you to use Vancouver and the surrounding Lower Mainland to explore particular topics. Reporting in Indigenous Communities, for example, introduces students to the ethics, cultures, histories, and politics of Aboriginal peoples in Canada in a classroom setting, and then “embeds” them in First Nation communities. The inaugural RIIC class, the only journalism course of its kind in Canada, looked at how B.C. First Nations communities are taking steps to heal themselves and one another. Student stories about everything from mobile diabetes testing clinic to suicide intervention teams to holistic sentencing were showcased in an online site called Shxw’éyelh: Stories of Health and Healing. The students’ reporting was also featured in a week-long CBC Radio series that aired across the province and in a one-hour episode of the national CBC Radio program, The Story From Here. Classes that focus on particular forms of storytelling make full use of the Vancouver backdrop as well. Students in Feature Writing have profiled Occupy movement founder and Lower Mainland resident Kalle Lasn, chronicled both the experience of gay Asian youth in B.C. schools and the rising number of grandparents raising children — and told the story of how one Russian immigrant brought the tradition of the Banya sauna with him to the West Coast. In Advanced Video Reporting, students strengthen their video storytelling and reporting skills by producing short documentaries that showcase issues unique to Vancouver and the surrounding area. “Art as a Means of Survival” reported on Gachet, an art gallery in the city’s Downtown Eastside that has played a key role in the lives of nearby residents battling mental illness but whose existence is being threatened by new housing developments. Not everyone in Vancouver can afford to live in traditional, single-family housing, however. Some are choosing cooperatives, with a focus on sustainability, as documented in “Live Collective,” while “Mobile Living” tells the story of a woman who has chosen to live in her RV. Students leave the class equipped with enhanced narrative storytelling techniques, a finished video project and the ability to shoot and edit video projects on their own. By the time you are ready to embark on your major project required to graduate, you will know where in Vancouver and the surrounding Lower Mainland the gems are there for you to mine and polish into a significant journalistic work. The stories students unearth are often modified for publication in mainstream media outlets. Recent examples include a shift to year-round schooling, a major oil company’s bid to increase oil tanker traffic, a portrait of B.C.’s poorest rural community, a town in an uproar over whether to provide clean needles to drug addicts, and what one student learned spending 10 days living on the streets. Somewhere in Vancouver is an important story waiting to be told. Will you be the one to tell it?